In addition to our Aftercare services, we offer rotating workshops and insight into what to expect following the death of a loved one. Throughout the year, we hold several memorial and remembrance services to honor those who have died, as well as those who have served our country faithfully. Another unique opportunity we offer is our monthly luncheon on the fourth Tuesday of each month at a local restaurant. Members of this small group have looked forward to having lunch together for more than 12 years. This is a time of fellowship and encouragement and we would love to have you our join us at our grief support groups in South Carolina. Please contact Dru Strickland at (843) 881.9293 or email dru.strickland@jhenrystuhr.com for the monthly schedule or check our Events tab. Lowcountry Pastoral Counseling Center is a non-profit, faith-based, ecumenical ministry sponsored by individuals and congregations. As we begin the New Year, Stuhr Funeral Home would like to invite the community to learn more about our “Journey of Hope” program. We designed this program to support individuals through their personal grief journey. The group meets weekly. Each workshop consists of 8 sessions guided by a professional facilitator. They are designed to assist individuals who are mourning the loss of a loved one. The focus will shift to a different aspect of the grieving process each week and you will have the opportunity to share and support one another. The structure of the program is designed so that anyone can join the group at any time. 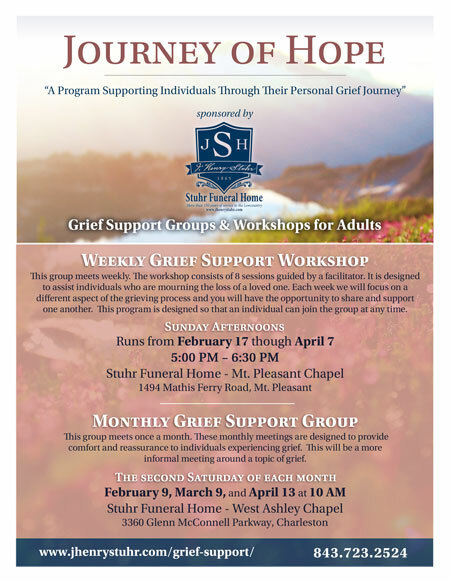 Programming begins with the Weekly Grief Support Workshop launch on Sunday, February 17th, from 5:00 PM – 6:30 PM, and will continue every Sunday afternoon thereafter until April 7th, 2019. Stuhr Funeral also offers another grief support group that meets monthly. These monthly gatherings are designed to provide comfort and reassurance to individuals experiencing grief. The format is more informal with a topic surrounding grief. The community is welcome. If you would like to attend a meeting or need additional information, please call or e-mail Ginger Selby (843)723-2524 or ginger.selby@jhenrystuhr.com. 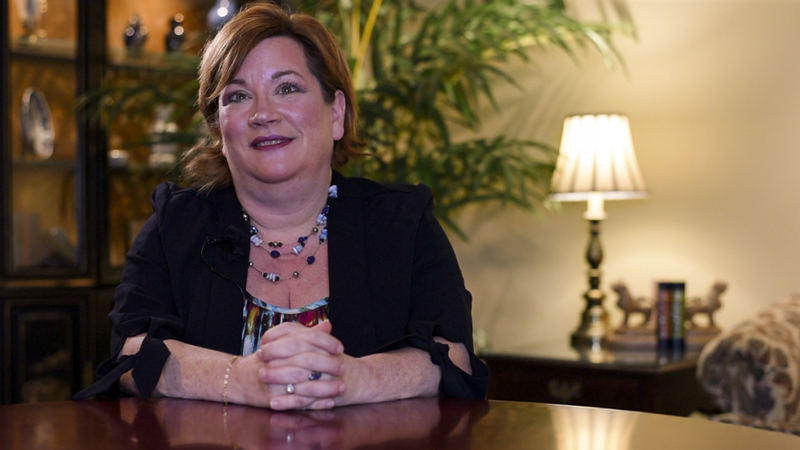 Hospice of Charleston Bereavement Services Caring for a loved one can be stressful. It can interfere with your work, your personal relationships, and even your ability to care for your loved one. If you are struggling, hospice may be the answer. Hospice can provide comfort to your loved one, skilled care, and nursing visits. It can even help your family with things like supplies, equipment and hospice medications. Help for those facing life-threatening illness – Palliative care is specialized medical care for people with serious illnesses. It focuses on providing patients with relief from the symptoms and stress of a serious illness. The goal is to improve quality of life for both the patient and the family. Palliative care is provided by a specially-trained team of doctors, nurses and other specialists who work together with a patient’s other doctors to provide an extra layer of support. It is appropriate at any age and at any stage in a serious illness and can be provided along with curative treatment. The Palliative Care Provider Directory of Hospitals is a resource to help you or a loved one locate a hospital in your area that provides palliative care. Association for Death Education and Counseling – Take advantage of ADEC’s many resources designed to support anyone seeking more information on the grief process, bereavement-related services, helpful organizations or those seeking or offering help with death-related loss. Suicide Survivors Group: 1st & 3rd Wednesdays at 7 -8:30 p.m.
Heartland Nursing Center, 1139 Sam Rittenberg Blvd. in West Ashley. Charlotte Anderson, 211 Hotline 843-747-3007.